‘British and the Sikhs: The Impact and Legacy of Colonial Dominance in the Punjab. I will be doing a talk on the British and the Sikhs at the Punjab Research Group meeting 3rd November 2012 at Wolverhampton University. 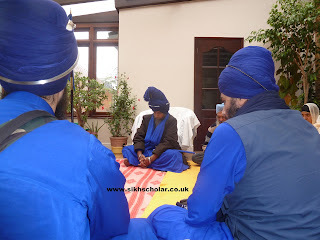 Sahib Singh Baba Joginder Singh the acting head of the Baba Buddha Dal has been in the UK visiting the sangat. He presided over Amrit Sanchar in London over the weekend and many Sikhs became Khalsa. This article was written for the Sikh Magazine Sant Sipahai and published in March 2010. For the Sikhs Guru Granth Sahib is the living embodiment of the Ten Gurus. The Granth contains the writings of the first Five Gurus of the Sikhs, the verses of the Ninth Guru, and one verse from the Tenth Guru. 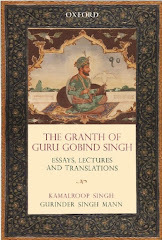 It also contains contributions from the Bhatts and Bhagats of India. Hence Guru Granth Sahib is a compilation of verses from many contributors but the common theme is that they all share the same vision of God. Sri Dasam Granth however differs in some respects in terms of tone and instructional value to that of the Guru Granth Sahib. Whilst this may seem like a problem to some; the Granth is complementary or moreover an extension of the themes in the Guru Granth Sahib. The sole writer of Sri Dasam Granth is none other than Guru Gobind Singh where he has written within it the dates and places of compilation.